Wedding season is upon us and if you are looking for inspiration for a statement cake, you will love the book, Alan Dunn's Celebration Cakes -Beautiful Designs for Weddings, Anniversaries, and Birthdays, published by IMM Lifestyle Books. When it comes to sugar flower craftsmanship, Alan Dunn is not only a master craftsman, he is a true artist in confections. As someone who loves exquisitely designed statement cakes, I fell in love with Alan Dunn's Celebration Cakes - Beautiful Designs for Weddings, Anniversaries, and Birthdays book, which elevates sugar paste into confection artistry. 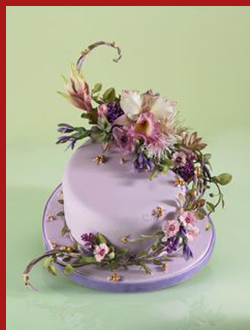 Whether you want to learn how to create stunning designs yourself or are looking for ideas and inspiration to give to your cake designer, Alan Dunn's book is sure to enchant. 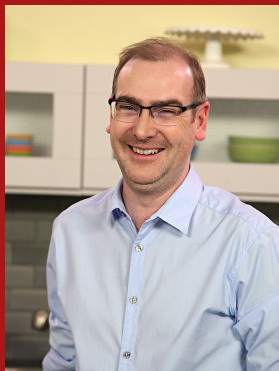 Alan Dunn is a highly regarded and renowned expert and sugar craftartisan, who is an accredited demonstrator for the British Sugar craft Guild and teaches classes and demonstrates techniques throughout the world. 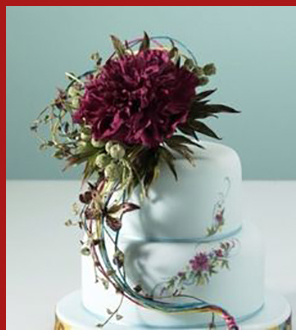 He has written 13 books on the art of flowermaking and cake decorating. Alan Dunn's Celebration Cakes - Beautiful Designs for Weddings, Anniversaries, and Birthdays not only provides sensational ideas and inspiration for special occasions that deserve a statement cake, it also provides you with the all the knowledge to succeed short of having Alan Dunn in the kitchen standing by your side guiding you, with its detailed step-by-step instructions. The book provides in-depth information and discusses what you need toget started in the chapter on "Equipment and Materials," and thoughtfully provides a listing of Suppliers on where to purchase specialty materials and equipment at the back of the book. The chapter entitled, "Recipes," provides essential recipes including how to make "cold porcelain," "royal icing," and "flowerpaste," and I found the chapter on "Techniques" to be especially helpful as it not only provides experttips, it always explains "the how" and "the why." Armed with my new found knowledge, I read the chapter on how to create, "Flowers, Fruits, and Nuts," with wild abandon. Alan Dunn guides the reader on how to make sensational, realistic-looking artistic flowers including Fringed nigella, Sweet violet, Rose, Peony, and Lilac, how to create vegetables including Asparagus and Radish, as well as Hazelnuts, and even a Fantasy Butterfly, to name but a few of the many creations that dazzled my eyes; the possibilities are endless. The last chapter is dedicated to "Celebration Cakes" and has wonderful designs for christenings, birthdays, anniversaries, engagements, weddings, Valentine's Day, and many more, and includes patterns to help you create thedesigns. The photographs throughout the book are simply irresistible inmouth-watering color to inspire flights of fantasy. 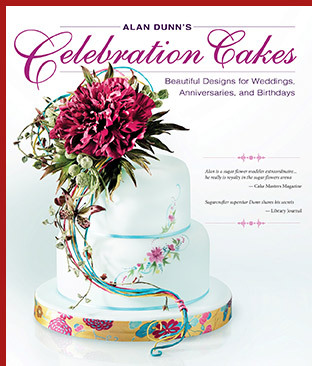 From cover to cover, Alan Dunn's Celebration Cakes - Beautiful Designs for Weddings, Anniversaries, and Birthdays, is simply irresistible, so let your imagination soar as you read this gorgeous book. is published by IMM Lifestyle Books and distributed by Fox Chapel Publishing in the United States. The book is available in book stores and online, including: Amazon and Barnes & Noble. © February 2018. LuxuryExperience. www.LuxuryExperience.com. All rights reserved.